It started with Intel quietly (but not too quietly) informing many in the industry of its plans to enter the graphics market with something called Larrabee. NVIDIA responded by quietly (but not too quietly) criticizing the nonexistant Larrabee. What we've seen for the past several months has been little more than jabs thrown back and forth, admittedly with NVIDIA being a little more public with its swings. Today is a big day, without discussing competing architectures, Intel is publicly unveiling, for the first time, the basis of its Larrabee GPU architecture. Well, it is important to keep in mind that this is first and foremost NOT a GPU. It's a CPU. 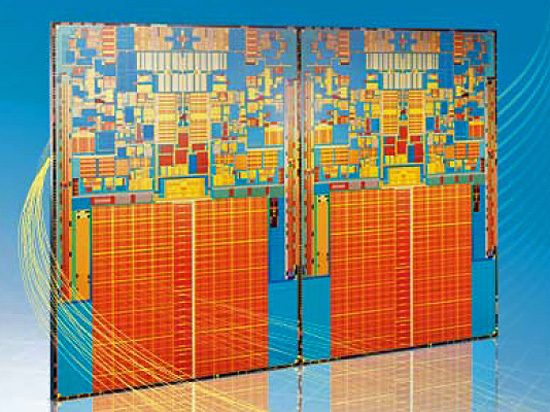 A many-core CPU that is optimized for data-parallel processing. What's the difference? Well, there is very little fixed function hardware, and the hardware is targeted to run general purpose code as easily as possible. The bottom lines is that Intel can make this very wide many-core CPU look like a GPU by implementing software libraries to handle DirectX and OpenGL. It's not quite emulating a GPU as it is directly implementing functionality on a data-parallel CPU that would normally be done on dedicated hardware. And developers will not be limited to just DirectX and OpenGL: this hardware can take pure software renderers and run them as if the hardware was designed specifically for that code. There is quite a bit here, so let's just jump right in. I not interested in the graphics so much. It may or may not compete with the the top end nvidia chips if released on time. What is more interesting is if this can easily be integrated as a general purpose cpu for non-graphics work? Imagine getting a benefit out of your gpu 100% of the time, not just when you're gaming. I know its possible to use more modern GPU's this way if you code specifically for them, but with its x86 architecture, it might be able to do it without having apps specifically coded for it. Larrabee will be shipped when Diablo III is, and it will mark the beginning of the end for DirectX. Calling it first here at AnandTech. "At 143 mm^2, Intel could fit 10 Larrabee-like cores so let's double that. Now we're at 286mm^2 (still smaller than GT200 and about the size of AMD's RV770) and 20-cores. Double that once more and we've got 40-cores and have a 572mm^2 die, virtually the same size as NVIDIA's GT200 but on a 65nm process. " and 572mm^2 is 327184mm is 160 cores..
Hahahaha, YOUR math is way off!!! I see where the article and you got your math..
you both did 143mm^2 / 10 and got 14.3 then divided 286^2 by 14.3 and got 20.. this math is only acting on the one number..
143mm^2 is NOT equivalent to 143^2 mm ... Your analysis is flawed. If we use your example, 2mm^2 is NOT 2mm x 2mm ... it's actually root(2)mm x root(2)mm ... 4mm^2 is 2mm x 2mm, not 4mm x 4mm (that'd be 16mm). That's it in a nutshell. mm² doesn't mean you square 143, it refers to Square Millimeters, a unit of area (unlike Millimeters, a unit of distance). Dang, that was supposed to read "(that'd be 16mm^2)."